The Royal Academy of Medicine of Belgium (ARMB) is a work centre, a centre of reflection, of exchanges of ideas, and an advisory organ for governmental institutions. 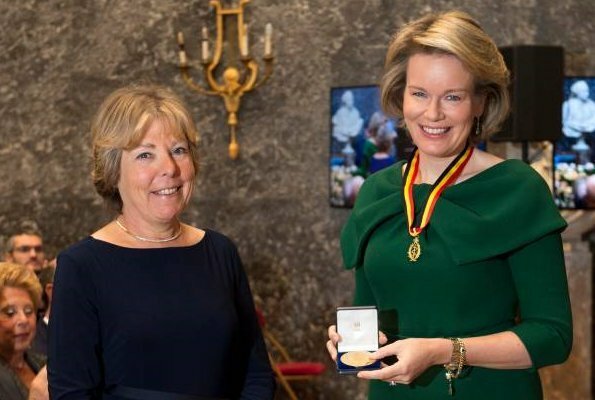 Belgian Royal Academy of Medicine (KAGB) advises the authorities and the citizens on matters relating to medical sciences. 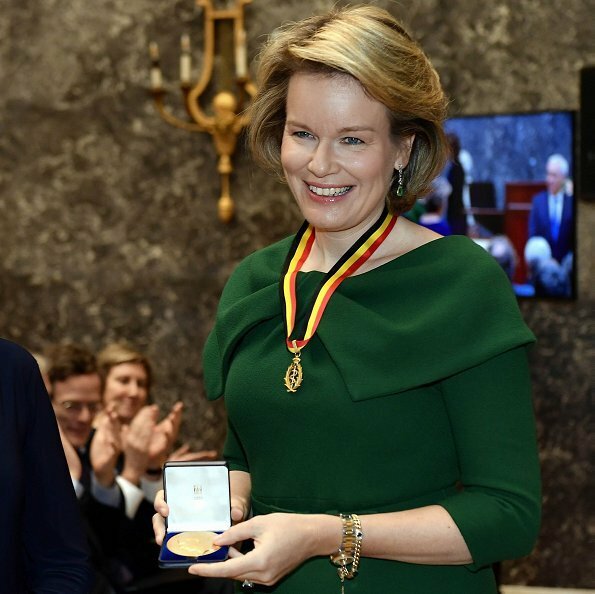 Queen Elisabeth was named Honorary Member of Belgian Royal Academy of Medicine in 1954 and Queen Fabiola in 1976. Eye-catching shoulder interest always looks good on Mathilde, and this dress delivers in that dept. -- but unfortunately it is too snug across the midsection. A great color, though, and Mathilde's hair is beautiful. You wrote exactly what I was thinking, so I will just agree! I don't know how to say this correctly but the dress seems to have a life of its own and doesn't flatter Queen Mathilde at all. It looks so much better on the very thin model. Maybe if it were a bigger size with a slightly flared skirt instead of the too-tight sheath skirt, it would look better on her. I wonder if she ever brings a shopping aide with her to tell her honestly what looks good on her. If we compare the pics of Mathildes's appearance on 12/02 and the previous one, I very much prefer the recent one, the dress seems to fit her better. I would even wonder whether she lost some weight. Met de jaren veranderd ons lichaam maar ik vind Mathilde nog prefect, je kan op alles zeuren. Mooi aan de hals en de donkergroene kleur. 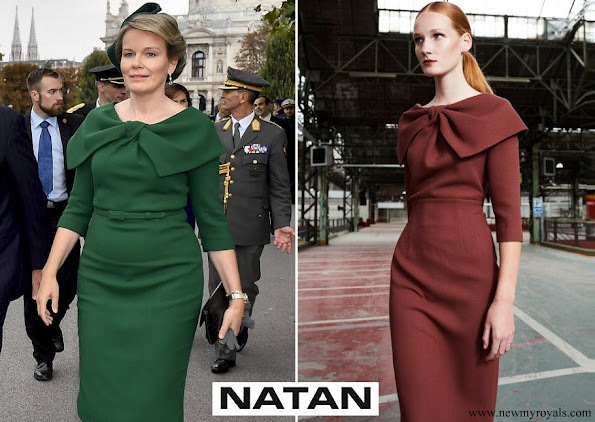 I really like this dress, interesting neckline, and good color, I don't think it's too tight itself, in my opinion she has a little bit of a belly, not unusual for a number of women,and cameras aren't kind to that area .It seems that we are so used to see perfect physiques, that we forget that this how real bodies are. If it bother her, she could wear a spanks underneath to smooth the overall look, but it looks to me that she is a very confident woman and prefers to be comfortable, and a couple of extra pounds don't face her much. I agree which either option, and she looks beautiful anyway. She looks very nice! The colour is beautiful on her and I love the neckline. Perhaps a little tight at her belly, but not annoying. Honorary Member of two academies. How fitting for a very hard working and beautiful Queen. Love the color of this dress and matching shoes.Wonderful look. 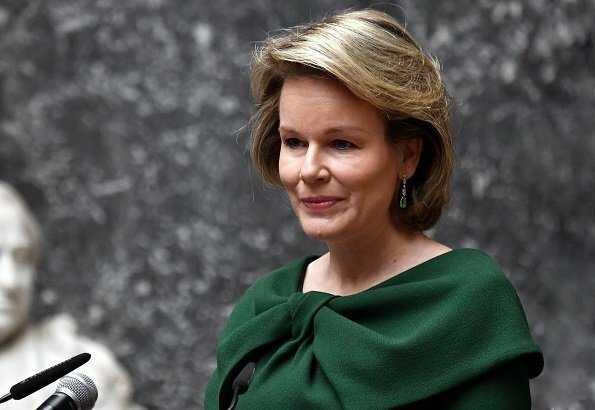 Queen Mathilde is a lovely lady with a beautiful face. This is a good color. 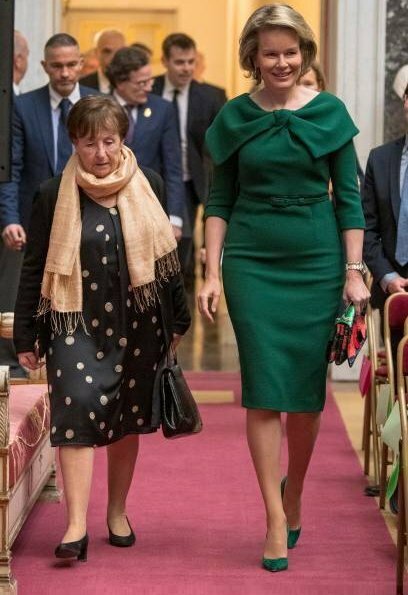 But why can't these royalladies, with all of their financial resources, find good taylors who could alter the dresses, so that bulges and other problem areas are not as noticeable. Maybe change designers. Lots of great ones out there, without resorting to Natan. Take a look at the last photo. Arms stretched out, she doesn't look comfortable in this dress. 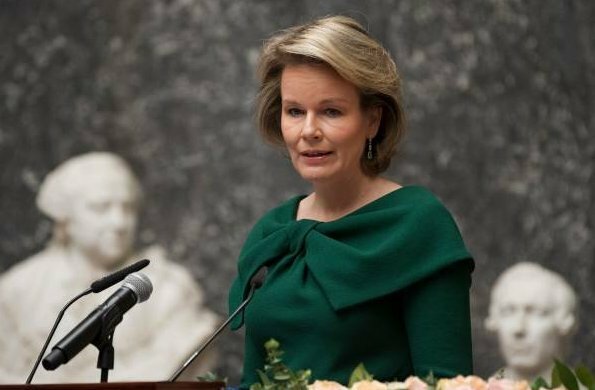 Queen Mathilde is very attractive woman but her outfits always makes her look much older. Just cross out the word "always". Almost always, it is wrong.!!!! I loved this dress, she looks very elegant and beautiful. I even prefer the green color she used than the brown from the model.